Just like other major sports and games out there, foosball requires you to develop certain foosball strategies and tactics in order to win games. Following a sound strategy that works well for you may go a long way in improving your odds to win any game. It’s probably worth pointing out that getting better at playing foosball not only requires one to get more skilled, but also improve their strategies and tactics. After all, your mental strength and knowledge of the game situation while playing the game matters just as much as your skills. The strategies below seem to be some of the most effective foosball strategies you may want to develop and use to your advantage while playing a foosball game. The idea is to spin the foosball a bit while dropping it into the center of the foosball table. This way, it will probably come towards your 5 bar instead of your opponent’s. 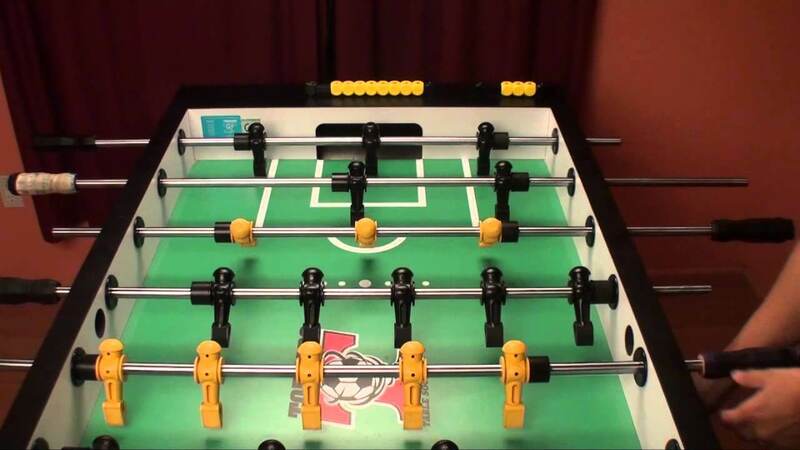 You can then move it back and forth for a few seconds (foosball rules doesn’t allow you to hold it with your 5 bar for more than 10 seconds), and quickly pass on to your 3 bar. Now though some players may prefer shooting directly from their 5 bar to try and score a goal, it’s actually not recommended. After all, foosball is all about passing and catching, as well as controlling and shooting the ball. You will have to master passing and catching eventually if you’re going to become anything more than a beginner. Many foosball players make the mistake of trying to become the jack of all trades and the master of none. This doesn’t really seem to be the right thing to do when it comes to foosball. Basically you just want to sit alone on your table and practice making a variety of passes from the 5 bar to the 3 bar. Start at the farthest away man and try making a nice easy pass up. Then move it to the next man and try again. And again, etc. Once you can do it fairly well slowly, try adding some speed to each man until you can get it up the field fairly accurately. As with everything, practice makes perfect, but if you want to increase the odds of scoring often, practice your passes up the field. Following the ball with your men is crucial. If you fail to follow the ball, you may be out of the game pretty quickly, nevermind winning it. This is because there are ample opportunities for getting hold of the ball if you keep following it everywhere it goes. Missing out on all those opportunities mean you wouldn’t get many chances to score a goal. Developing this strategy also helps you improve your defense significantly. The problem is, this comes with practice. Play as often as you can, and if you don’t have a partner, play alone and practice passing and practice nailing it against the walls of the table and then stopping it with a man as it comes flying back down. The more you can do this while the ball is moving quickly, the better your eye will become at following the ball naturally. Sure you can win most games if you can score enough, but sooner than later you’ll run across an opponent who’s just as skilled at scoring as you are. Developing a good defense is crucial if you want to win games against all type of players. The practice we recommended above for eye training can work here too. Nail it as hard as you can and try to stop it before it comes back to your end. Practice stopping it with all sorts of rods and positions. When you play a real game, practice what you’ve been learning and choose to play every second game with a focus on defense, for example. Alright so this isn’t technically a strategy, but it’s the best way to improve your strategies. There’s probably nothing out there that can help you more than playing against players who are more experienced than you. It helps you find out the areas of improvement you need to work on, as well as refine your skills.